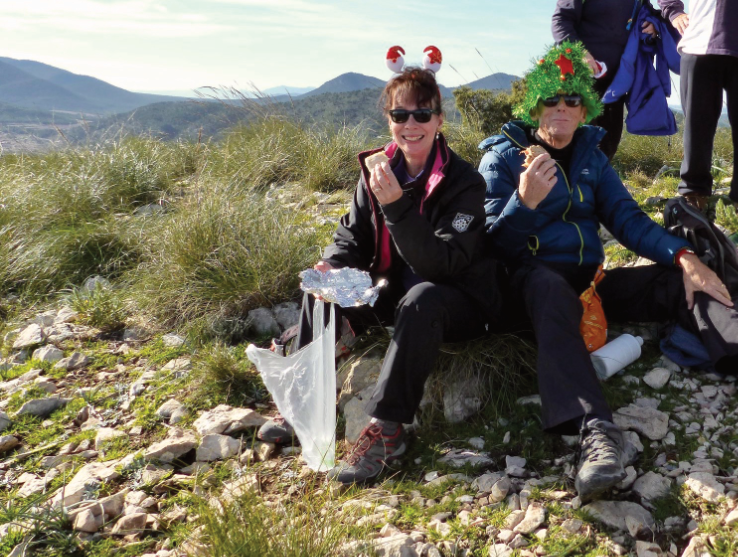 It seems so long ago now, but I thought that I’d show some photos of us all enjoying our pre-Christmas trip to the top of El Castellar, near Bullas. You should just be able to make out some silly hats and maybe a few glasses of cava (carried up by ‘willing’ volunteers). Although not quite Christmas, it was the last chance to enjoy each other’s company before everyone disappeared back to all their different destinations for holiday festivities, so the photos are from more than six weeks ago on Saturday 15th December. If you can make out mince pies (vegetarian) and sausage rolls (non-veggie) they were the delicious result of David’s generosity and hard work. Not one to do things by halves, he was also the leader of the day’s walk. 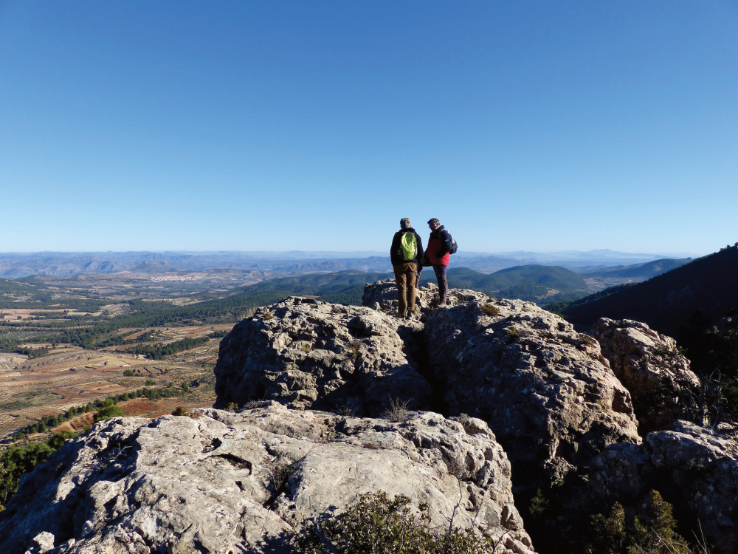 At 8.5km it wasn’t a long route, but with the summit at 993mtr (start 643mtr), we did have to work a bit for our rewards – it’s always good to have an incentive as we’ve climbed El Castellar on many occasions before. We ascended steadily up varying levels of steepness and parts that in places were difficult underfoot due to stones, boulders and rain-worn rocks. 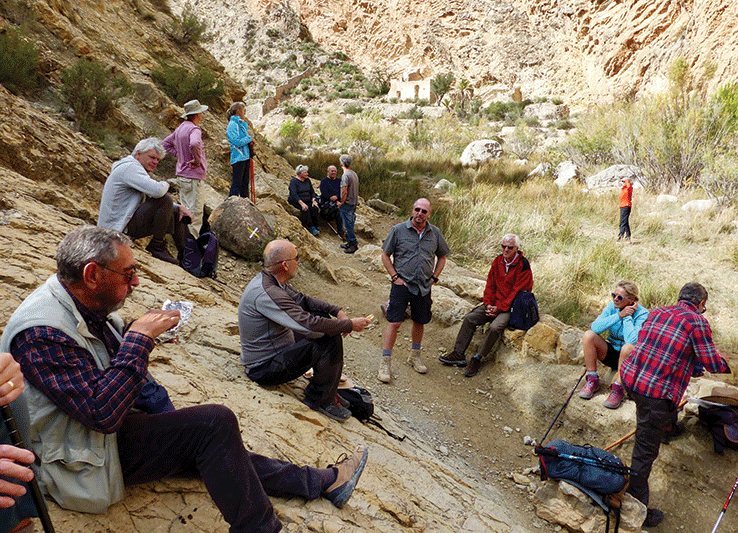 We stopped to rest first at the ruins of the Moorish fort and again, at the false summit. 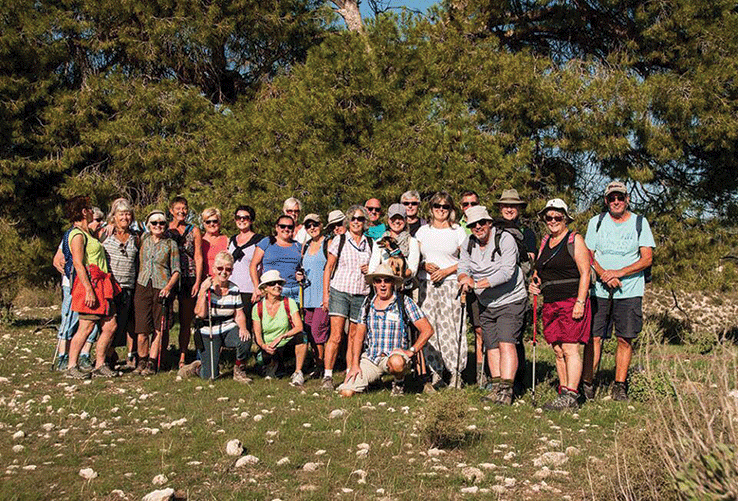 True to his word, David gave us plenty of recovery time on the way and eventually at the top, we were able to enjoy the fabulous 360° views across the whole of the region of Murcia. Before starting our picnic and immediately after opening the cava, we paid a solemn toast in memory of our recently deceased friend and co-founder, Lawrie Hunt and thanked him and wife Pat’s efforts for initiating WARM and enabling us all to enjoy the beautiful scenery and friendships that have been such a positive consequence. 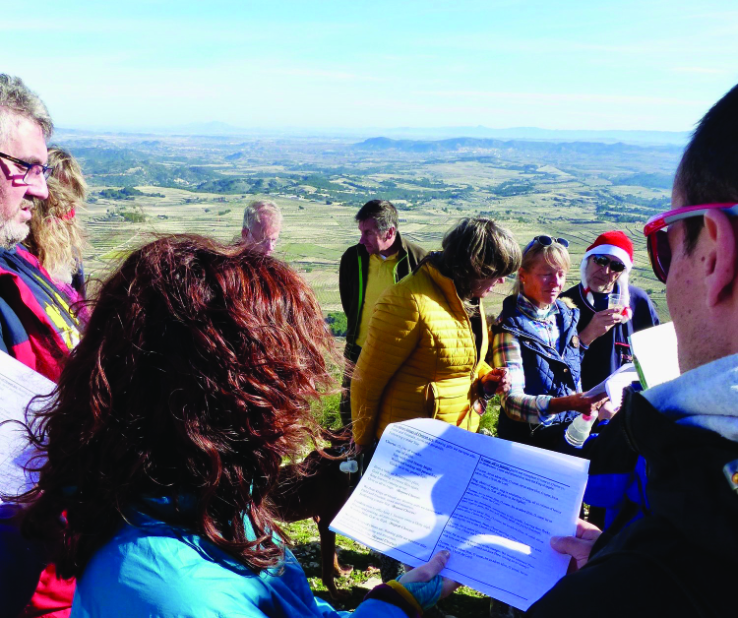 Appreciating their spirit of finding fun in life, we continued with a lot of silliness and some well-known carols. 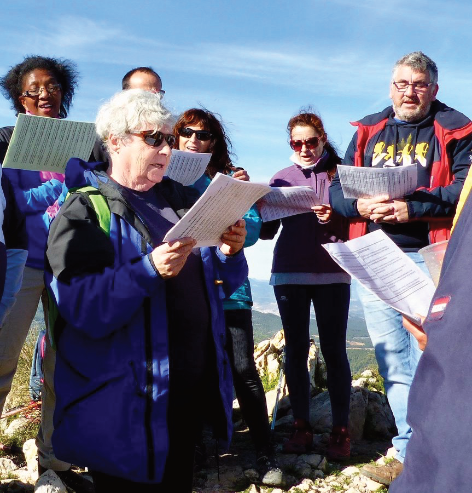 It was very heart-warming to have the mix of friends of all nationalities singing together and thank heavens Donna had thought to print some crib-sheets for us all. We returned on the same route stopping briefly to visit the famous beauty spot of the Salto del Usero. In usual style, we then detoured to a local bar to share a few last minutes of 2018 together. Following the publication of the first volume of the book of some of last season’s walks, we are starting to adopt a similar system of difficulty ratings for all of our walks. As the size of the group becomes larger, we recognise that there is a very wide range of fitness between members. 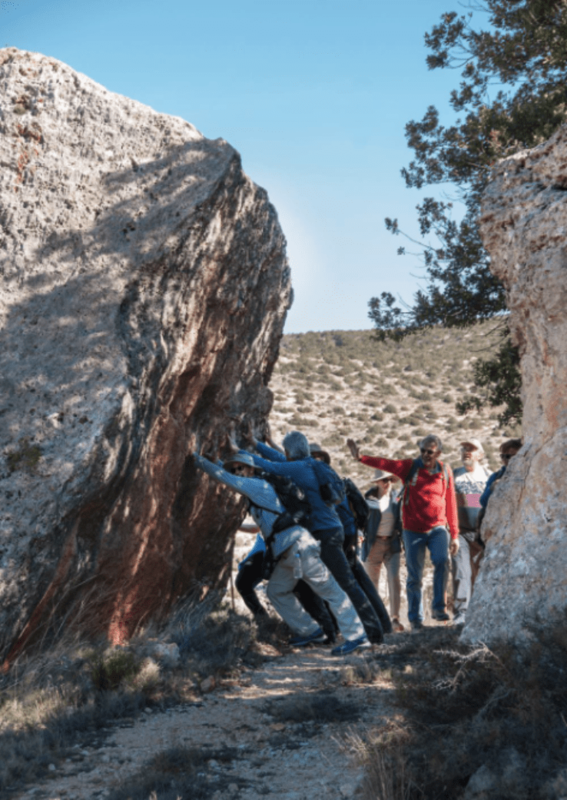 In an attempt to ensure that everybody enjoys the experience of exploring with WARM, we are including further information in each walk description against the three categories of: Effort, Agility and Vertigo. Although it’s still very much ‘work in progress’, hopefully it achieves its objective. The ratings are obviously very subjective, therefore, after every walk, we ask people to comment, so that eventually we’ll achieve a consensus that everybody will find useful. 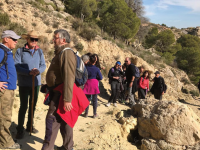 On Saturday 12th January, for our first WARM walk of 2019 we ventured out to a very hidden corner of the region; to the village of Otos – did any of you find it? It’s sort of northwest of Calasparra on the way to Socovos. From Calasparra you have to pass through Castilla La Mancha Province for a short while before returning into Murcia. Passing through Calasparra on the way, at 9am the car thermometer was registering –5.5°C! Otos is a tiny village on a road that comes to a dead-end in not very many kilometres, but very importantly, it does have a good restaurant! Although at just short of 10km, this route did involve a couple of strenuous climbs, (effort and agility both rated at 4 out of 5), we needed to stop in a few places to recover our breath before eventually arriving at the plateau and being rewarded with the impressive views. Ten very grateful people appreciated June’s offer to lead a less steep alternative. 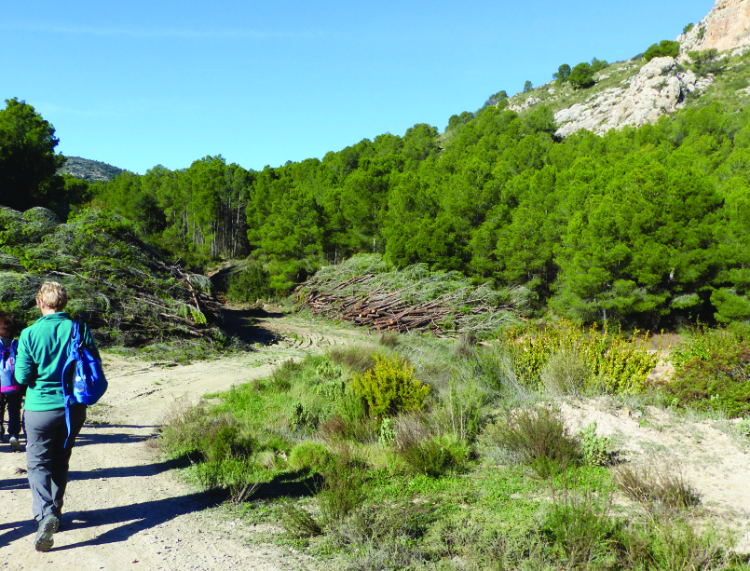 We eventually resumed our route and could enjoy a nearly level section across the plateau before descending through the shadow of the pines where we paused for a snack, grateful to at last find a small glade that offered a bit of warm sunshine. 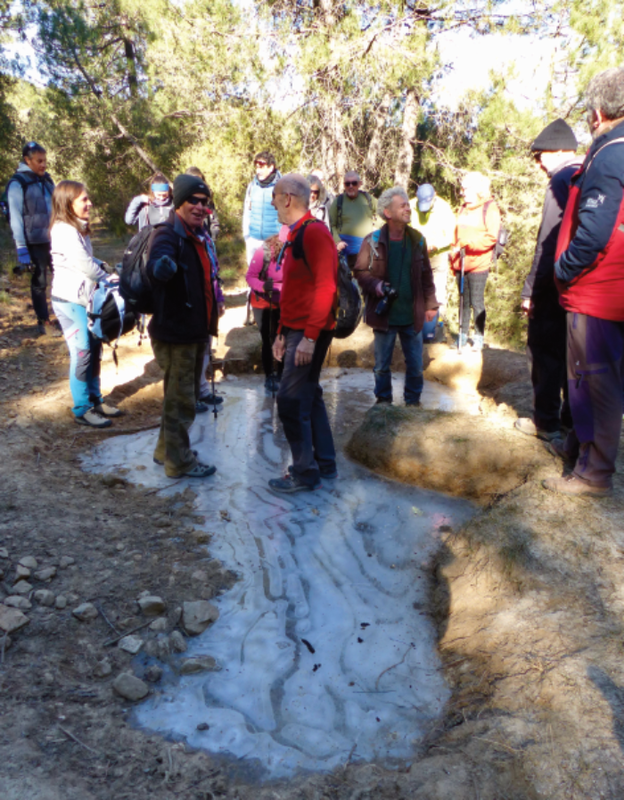 Throughout the morning, even in the sunshine, the discovery of some seriously icy bits had us all in playful mood in this famously warm region of Murcia, but walking together isn’t just about exercise, is it? 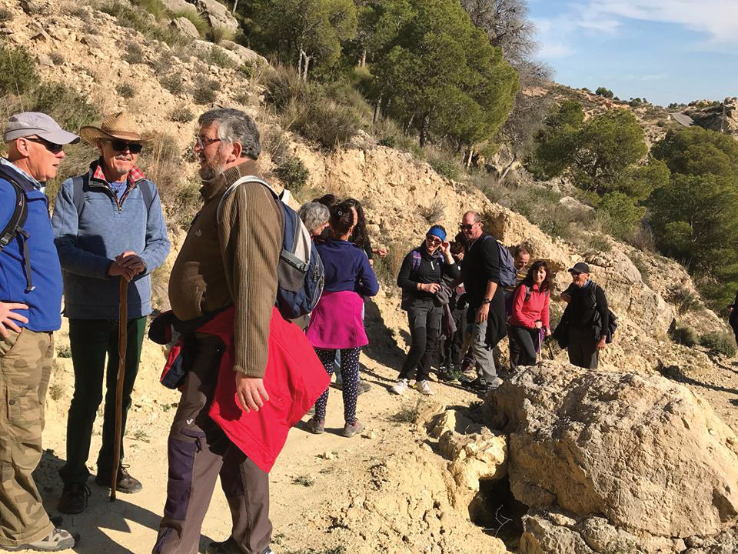 On Saturday 19th January Norma and Chris incorporated a cultural visit in their walk. Full details of future outings will be sent to those on the WARM mailing list, normally about a fortnight ahead. If anyone would like to be added to this mailing list, please contact Jessica on Warm2005@gmail.com. Please indicate where your nearest town is. The majority of outings are in the northwest of the region and only those who are on the mailing list can access the closed WARM Facebook page.